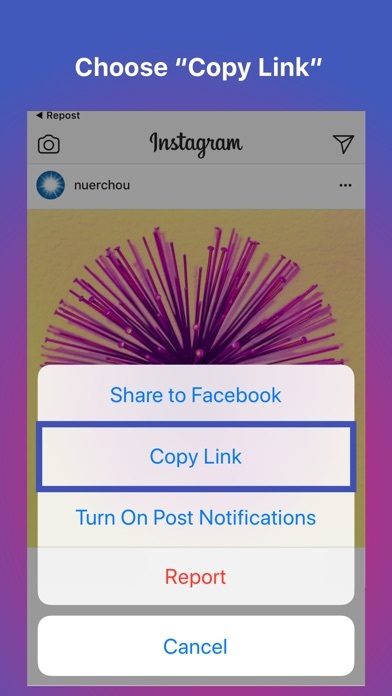 Repost Instagram videos and photos: Easy to use: When you want to repost a post in Instagram, you just need to copy the share URL, and open Repost app. Everything will be done right for you. 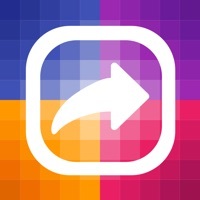 Instagram™ is Instagram’s trademark. 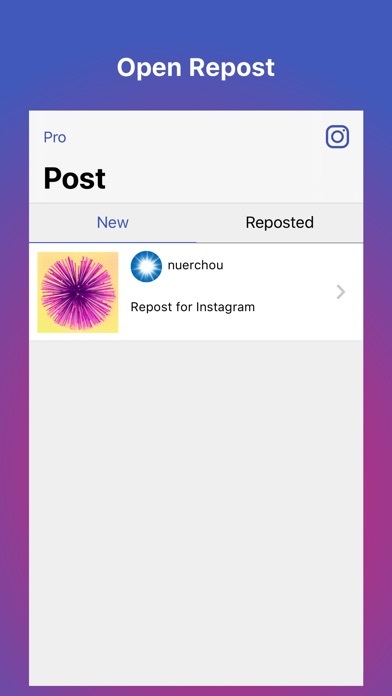 Repost is not affiliated with Instagram, Inc. Repost app requires an Instagram account to use. Can’t get this to work. Follow instructions. Nothing. App keeps closing every time I try to repost. I paid for the pro version and it performs like an amateur. I demand a refund. Why did I pay for something not to work ? It keeps showing a pic of something of what I’m not trying to repost. Where do I get my refund. App seems to work pretty good with the exception of undesirably cropping video and not offering any selection on where watermark goes. Long story short... App doesn’t work. Tried several times but the copied posts do not go to this app. Trash!!! The app doesn’t work. I copied the link several times but the app does not pick it up. This app hasn’t work since I downloaded it some time back. I bought the pro version and it doesn’t work! I have not been able to repost. I copy the link and when I return to the app to repost, nothing is there. Very disappointing. Whatever is wrong needs to be fixed. Especially since this app is not free. I want our money Back!!! Put a resize feature so you can fit the whole clip or pic in and it’s 5 stars for me. Just keeps giving instructions but doesn’t do anything. Maybe there is a bug but it drives me crazy that it does not load the photos and text on on consistent basis. This app did not work at all. TRASH, DONT USE IT! Hola no he podido repostear nada? Que pasa? None of these repost apps seem to work. Since when did it get so difficult to repost videos!? I paid the 2.99 for pro and it doesn’t work! I want my money back! This app does not work! Probably just an app that hacks into your IG account. Don’t risk downloading it. Didn’t do what it’s intended to do at all. Can I have my $2.99 back? Ya killing me! I followed step by step directions and it doesn’t even save to your files in order to repost on Instagram. I’m getting tired of all the repost apps. The app works well but captions do not copy. It could be user error on my part but otherwise it works well. Link copied to clipboard but this app can’t read it. No repost possible. My $3 and change has been charged for a “one-time” fee for the app and I am following all of the directions but STILL not seeing the repost option available so I can repost. App will not allow me to repost anything. I purchased the pro version and it's like the app bricked itself. 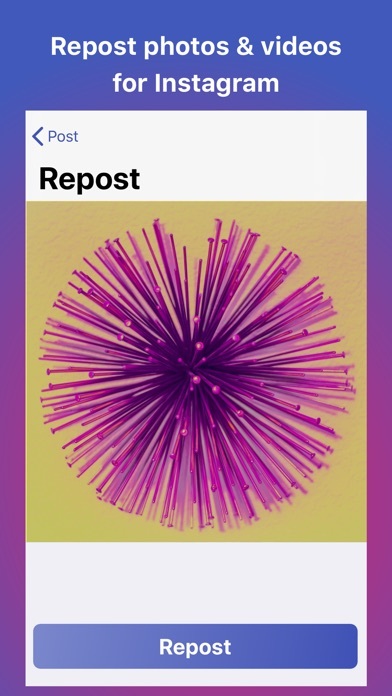 The WORST repost app, they charge you 3 dollars, can’t copy and paste the caption on the shared pic, can’t share/repost videos. This app is a scam. THIS APP CANNOT SAVE VIDEOS TO YOUR CAMERA ROLL. it doesn’t even work to send them to your shared icloud camera roll and save them from there half of the time. 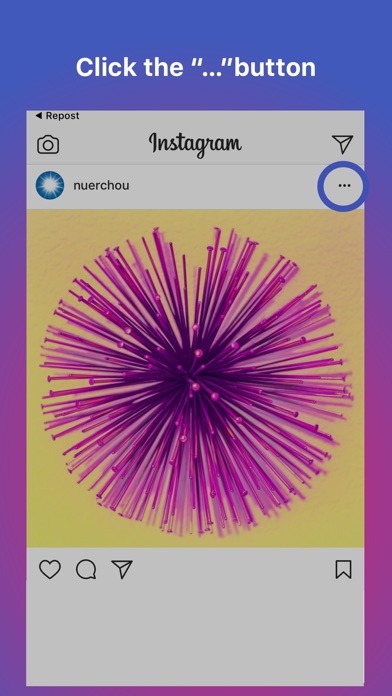 If you want to repost an image that’s not the first image in a multiple-photo post this is not an option with this app. It will only repost the first image. You also have to pay to remove the watermark. Which I stupidly did before I realized this app wouldn’t even post the image I wanted. Useless.